"I fell in love, I don't know why," confesses Alaa al-Sayed with a lingering gaze towards his beloved. The object of affection for this Syrian historian is the ancient gate of Bab al-Nasr, the Victory Gate. Like the other historic entrances leading into a warren of cobbled lanes in Aleppo's old quarter, part of its arch of thick stones collapsed in the combat which raged here. Bab al-Nasr isn't the grandest or the most damaged of gates in the medieval walled city that became one of the bloodiest frontlines in the brutal battle for Aleppo that ended a little more than a year ago. 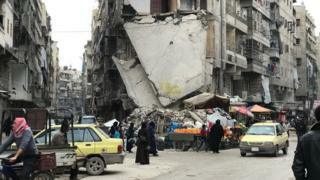 But, in the broken stretches of this city, Syrians now mend what they care about most, bit by bit. That's how this painstaking and painful process of rebuilding a celebrated city goes. No one, including the government, has the eye-watering sums it will take to renovate old Aleppo's storied heritage, and restore the basic services that make a modern city run. Estimates put the cost at tens of billions of dollars. "We formed a little committee called the Friends of Bab al-Nasr," Alaa tells me as one of the old city's remaining master masons hammers a row of paving stones into place. "We're not rich, but we do have some money to spend on our city." It's a city where streets in what was the rebel-held east are still strewn with mounds of rubble, and the detritus of those forced to flee. A child's shoe, a metal tea pot, a T-shirt are all that's left of their lives. War is etched into this urban landscape; pancaked buildings and rows of houses with their fronts blasted off. But life is slowly returning to the ruins. In one of the worst-affected neighbourhoods, Um Khalil shows me what she's been able to afford to fix, so far. The ceiling of her family's drab dwelling has been repaired with rough patches of plaster. Window frames now sealed, imperfectly, with plastic will have to wait. There's no electricity or running water. Her family is the only one in her damaged apartment block to return so far. Like most Syrians who've come home, they took refuge during the worst of the fighting in government areas like the coastal province of Latakia. "We borrowed some money to fix the ceiling," she tells me as three of her six children nestle close on a lumpy sofa that is now her only piece of furniture. Her husband stares blankly, his vacant expression a poignant measure of all their loss. Shattered lives will be the hardest of all to repair. "My husband doesn't work now," Um Khalil explains. "His factory was destroyed but we hope it will be repaired." Factories, big and small, used to be Aleppo's economic engine in what was Syria's industrial heartland. Now, the Leiramon Industrial Zone on the very edge of the city bears witness to the fighting which ravaged large parts of this city. The current frontline is only hundreds of metres away. "I had a heart attack," Bassel Nasri exclaims to convey the enormity of his emotion when he first set eyes on his plastics factory, which had been one of the Middle East's biggest producers. "It was terrible. Everything was destroyed." In truth, he suffered a real heart attack much earlier as daily reports charted the systemic destruction of his family's business, and the looting by hard-line Islamist groups who established their bases here. On one ruined stretch of this hollowed landscape, only one textile factory has sputtered back to life with a noisy generator that shatters the silence. Inside, on one half of one factory floor, stacks of bobbins spin white threads of cotton yarn. Of the machines that have been fired up many are from China, one of President Bashar al-Assad's allies, where Syria can buy spare parts. On the other side of the floor, some hulking machines lie silent. They were made in Britain, a key supporter of the opposition. "Rebuilding will take a lot of time and a lot of money but what we really need is for Western sanctions to be lifted to help us import and export," explains Nasri, who is also the vice-chairman of Aleppo's Chamber of Industry. But the war is not over yet. US Secretary of State Rex Tillerson made that clear again in his latest speech: "We will discourage economic relationships between the Assad regime and any other country." Defiance also fuels this rebuilding effort. The hashtag #Believe_in_Aleppo is splashed across a banner beneath the stone ramparts of the ancient citadel. Next to it, a billboard of a smiling and waving President Assad seems to proclaim the belief that he's here to stay. You see it on Aleppo's skyline: the tallest building is now lined with an elongated Syrian flag and the president's image. You hear it in the schools being repaired and reopened in former rebel-held neighbourhoods. "With our souls, with our blood, we sacrifice for you Bashar," screech schoolchildren drilled to sing the patriotic refrains in the largest school in east Aleppo. Schools are now largely staffed with teachers from the west of the city. "If we love our country, we must love our president," Muhammad Bayazeed tells me against the din of a schoolyard now filled again with squeals of laughter and children's games." The situation is much better than it was months ago, and it will continue to get better." The civil servants, including doctors and nurses, who stood up against the old order are gone, their stories now written out of Aleppo's new narrative, almost as if they were never there. The city's relatively wealthy western neighbourhoods didn't bear the brunt of the painful years of battle. But its residents also lived through sieges, and the fear of recurrent random attacks. Many Aleppans, except for the president's ardent supporters, now shy away from answering questions that touch on politics. "After a war, something changes in people, and something changes in the city," reflects Syrian photographer and film maker Issa Touma, who has documented the pain felt on all sides in his city. "Some people will never come back, and some parts of Aleppo won't either." He points to the wide streets now cleared of rubble at the foot of the soaring citadel. Sweet coffee and tea are for sale from the back of trucks with a dash of the city's famed entrepreneurial spirit. "Every month, you see little improvements," Touma says with a hopeful sign as a cold winter's rain falls on his jaunty hat. "This is what people here want to focus on now." But, he adds, "politics is still on their minds."